Adobe has responded quickly to the kerfuffle over the new Apple Final Cut Pro X (see previous post) with a new switcher / upgrade program offering 50 percent off on the Premiere Pro CS5.5 video editor or the Creative Suite CS5.5 Production Premium bundle (see previous post on CS 5.5). This is something of a culmination of Adobe's strategy to return its suite of production tools to the Macintosh platform starting with CS3 in 2007, after the Mac's transition to the Intel architecture. CS3 also saw the integration of Flash and other tools from the Macromedia acquisition. Tight integration to import native Photoshop and Illustrator files complete with layers, and to move directly between After Effects, Adobe Premiere Pro, and Encore without delays for intermediate rendering using Adobe Dynamic Link. Native editing, especially for tapeless and advanced formats including RED, DPX, P2, AVCHD, and XDCAM, without requiring format transcoding or rewrapping. Open workflow for projects using other tools, including roundtrip editing with files from Avid Media Composer, Avid Pro Tools, and, yes, Apple Final Cut Pro. Native 64-bit Mercury Playback Engine for multicore optimized and GPU-accelerated real-time effects, color correction, and rendering. 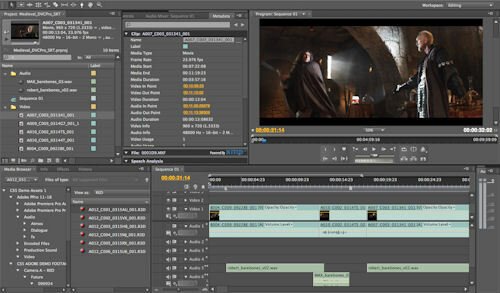 Plus higher color fidelity, and real-time 3D editing with CineForm. In addition, Premiere Pro also includes the revamped Adobe Media Encoder for batch background encoding, OnLocation for direct-to-disk recording and on-set monitoring with associated metadata, and Encore for Blu-ray Disc authoring with motion and multipage menus plus interactive web DVDs. The offer is good for owners of any version of Apple Final Cut Pro or Avid Media Composer, and ends September 30, 2011. And previous Adobe users are not left out -- the 50% deal also is available for owners of various earlier versions of individual products and suite editions, even going back to Adobe CS 2 and Macromedia Flash. See my article, Summary: Adobe Creative Suite 5.5, for a breakdown of the tools and suites, and highlights of what's new with the CS5.5 applications. See my Video Editing Software Gallery for more on consumer and professional video tools. The new Adobe CS5.5 Production Premium portion of Adobe Creative Suite 5.5 update (see earlier post) steps the core production tools to new 5.5 versions, including Premiere Pro, After Effects, Media Encoder, Device Central, Flash Professional, and Flash Catalyst. CS5.5 also adds the full Adobe Audition audio editor into the suite, replacing the simpler Soundbooth tool from CS5. Audition provides deep support for multi-track recording, nondestructive editing, and mixing, plus audio restoration and effects. The new Audition now is native on Mac and Windows, with a rebuilt multi-threaded playback engine to import and edit and apply effects in parallel. The improvements in CS5.5 Production Premium extend themes that we have seen developing in previous versions of the Creative Suite, including straightforward workflow editing directly in native file formats, 64-bit performance with more GPU-accelerated effects for powerful editing even on a laptop system, integration across Adobe applications and with other products, and delivery beyond conventional computer and Web formats to smartphones, portable devices, and Internet-enabled televisions. So what does the new CS5.5 Production Premium tell us about Adobe's ambitions and the state of video editing? Part of this is a continuation of trends across previous Creative Suite releases -- smoother workflow in response to customer feedback, focus on cross-platform performance (Mac / PC and workstation / laptop), interoperability within the suite, and open formats to work with other products. There's also a strong push by Adobe further into the broadcast and film markets, with end-to-end metadata starting with scriptwriting, RED camera support, and rapid editing and multi-format delivery in news broadcasting. But at the same time CS5.5 expands options for independents, with fully-accelerated editing on laptops, native support for DSLR video cameras, and Audition now on the Mac with deep audio correction and enhancement tools. And don't forget the subscription access to any or all of the suite of CS tools, available when needed, or just to experiment. Find Adobe Premiere Pro CS5.5, CS5.5 Production Premium, and CS5.5 Master Collection on Amazon.com. If you're looking to boost your sound system, for your home theater and/or your computer, then definitely take a look at the new Logitech Z906 Surround Sound Speakers. This is a full 5.1 surround system, in a relatively small package, with a clean design plus a nice control console with remote control. It's THX-certified, and pumps out 500 watts of Dolby Digital and DTS sound, from up to six inputs including TV, DVR, DVD, Blu-Ray player, Xbox 360, PS 3, Wii, iPod, and PC or Mac laptop. The front and rear speaker pairs are approximately 6 1/2 x 4 1/4 x 3 1/3 inches, and are wall-mountable, along with the similarly-sized center speaker. The subwoofer is an approximately 13 inch cube that pumps out 165 watts. When we cranked it up we could clearly hear the sound outside the house, much like you do outside a movie theater. The subwoofer input connections are six-channel from PC sound card, RCA stereo, digital optical, and digital coaxial (there's also a 3.5 mm aux input on the console). The console has a spare design with indicators that are still effective when adjusting it across the room with the remote control. For example, the volume dial uses a circle of LED lights, which actually increase in brightness as you step up the volume. The Level select then lets you control the volume for only certain components: subwoofer, rear, center, or all. There's also an Effect select to choose how to process stereo input: Stereo 2.1 (front only), Stereo 4.1 (stereo front & rear), or virtual Stereo 3D. We found the 4.1 setting to be too strong from the rears in our set-up, but the Stereo 3D was subtle but very effective, filling the room well, especially in a sub-optimal space with non-ideal speaker placements. In comparison to the TV speakers, the Z906 clearly added the low-end without being overly muddy. It was great for music, for loud movies like Transformers, and also even for the more polite sound of a golf tournament, with clean, natural speaking voices plus a low rumble from the outdoor setting. The Logitech Z906 Surround Sound Speakers could be a nice upgrade for your home theater, video gaming, and music listening. The clean look and relatively compact size fits nicely into existing spaces. They are available for around $339 (street price), and even include the speaker wires (albeit not digital cables). See my Audio Accessories Gallery for more on speakers. Entries posted to Manifest Tech Blog in July 2011, listed from oldest to newest.